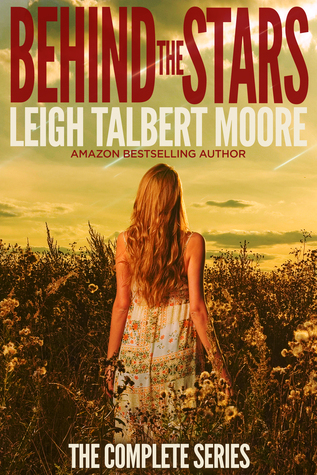 I am always on the lookout for some new and fresh and Moore has managed to do just that in her new book Behind the Stars. So very different from anything I have read by her yet or even in this genre by anyone. It is described as Red Dawn meets Lost and I think that is very fitting because this was quite the read. This doesn't necessarily have action in it so much as it just had a lot going on between the past and present that kept you turning the pages and constantly guessing. Flashes of Prentiss' life before the invasion and during and what it all means for her and those she cares for gave insight to her feelings about her life then and her life now. Prentiss is a smart girl in a life where smarts and determination aren't always smiled on. Her small town is very backwards at times and the whole place has an almost sad feeling to it. In fact, I would guess the kidnapping of her and several town's people, is the most exciting thing to happen to it ever. This was a very interesting read. One filled with choices that not only changes Prentiss but makes her stronger too. Makes her really shine and see who she is and what she can become when she doesn't always have others to lean on for help and to fight her battles. I liked this, it was much different from Moore's other reads but in a good, entirely original kind of way. I am a fan of Moore's and I have been from the beginning and reads like this, just show me all over again why I can keep turning to her work when I want something fun, entertaining, and original. I already have Rouge because of you, but haven't read it yet. This sounds good too. And I'm glad it's the serial in one novel. I am too, it would have been hard to wait! New and fresh you say, Ali? Count me in! I'm always on board for something a little different, and something that's fun and entertaining as well:) Thanks for putting this one on my radar! Thanks Jenny for stopping by! YES! A character who learns and grows and adapts! I know, I love it when that happens! This does sound very unique and I like the sound of the character development. It's really rare to find original storylines nowadays! That is so true Nick, thanks for stopping by! I'm not sure how I feel about the past-to-present thing, but the rest seems to be wholly original, which is a huge plus after what I've just finished reading. I'll take weird and original over old and repetitive any day. Hmmm... I'm very curious about what is going on! Sounds different! I haven't read her but I love the fact that an author can go in a different direction. Sometimes I start reading a novel and know just by the writing who it's by that's good and bad. Ye sit can be both good and bad sometimes, I agree. Flashes between past and present can be tricky, but I really enjoy those reads when well done and this sounds like it was. Glad you enjoyed this one Ali. I'm curious was there much romance or mostly Sci-Fi? Ooh Red Dawn meets Lost? That sounds super cool! Glad you enjoyed this Ali! I'm not familiar with Red Dawn and not versed with Lost although I know the latter is infamous for its mind fuckery... right? Yeah but this didn't really have a lot of that. New and fresh is ALWAYS good. Sounds like a great one. It's so rare to come across an author that deliver something completely fresh & new, and I LOVED Lost, so you're definitely speaking my language in your review. The SciFi label has me hesitating a bit though. The sci fi aspect really isn't too bad at all I promise. I like that it kept you guessing as you moved back and forth from past to present. you're right, it's always so interesting to have something different. IF the sci-fi aspect isn't too much... maybe. thanks for the discovery! It really isn't too much at all on the sci fi. Great review! I've never actually heard of the author before, but I am intrigued. I don't read much sci-fi though, I'm not sure why. Glad you enjoyed this one. This sounds really interesting, I have to say. I hadn't heard of it! I am always up for something different..but did you say invasion? As in aliens? The description doesn't say much, but from your review I'm guessing there's an alien invasion? And they're abducted? Since it's compared to Lost maybe that's part of the mystery. Sounds like a good book though. I like intelligent main characters. I like when books of this genre aren't predictable. I hate when I figure out what's the big secret after 30%. Thanks for the review. I have been curious about this.